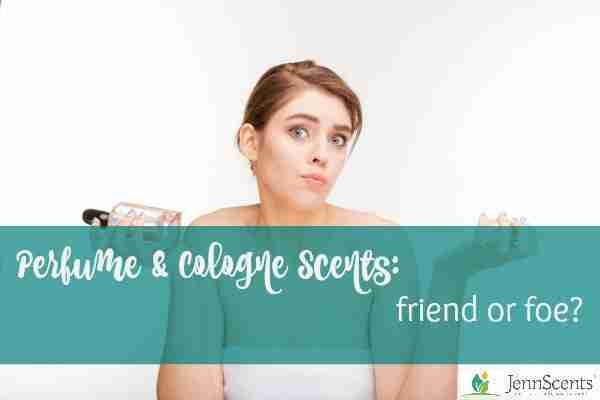 Perfume & Cologne Scents: Friend or Foe - JennScents, Inc.
Have you ever walked into a store, and everywhere you go, there is a stream of a strong, powerful perfume or cologne? Most of the time people make a face as the extreme odor takes their breath away. If you could see the vapor trail, it would lag behind the person wearing that perfume for miles. That can’t be good for you. You’ve heard of second-hand smoke? Well, this is second-hand chemical exposure. Did you know that many perfumes contain thousands of chemicals to give you that distinct scent? And where do you wear perfume? On the neck…where lymphatic glands and the thyroid is located. Any lightbulbs going off yet? There could be a correlation between synthetic perfume use affecting normal thyroid function. Most of these chemicals in the perfume are known carcinogens, hormone and thyroid disrupters, and congests the body’s natural eliminative channels – colon, liver, lungs, lymph, kidneys and skin. You might not notice anything after wearing a perfume one time (other than a headache). But after an accumulation of wearing this perfume for days, weeks and years, you may notice a plethora of health issues popping up. This is not a coincidence. If you are the slightest bit of health conscious, you will consider the next perfume you decide to wear. It not only affects your health, but everyone around you from family, children and pets. Some people have Multiple Chemical Syndrome, which makes it very difficult to go anywhere in public as these lingering, toxic chemical filled vapor trails can shut someone’s body down in minutes. And the recovery can be weeks. There is more research being conducted on the effects of perfumes on the mind and body. You already see links to a variety of disharmonies, diseases, and dementia. I encourage you to do your research on the perfumes you choose to wear. Why not create your own perfume with 100% pure essential oils and botanicals to not only smell good, but boost your immune system. 100% pure essential oils lend many health benefits – physical, mental and emotional. Your can have a perfume that multi-tasks, just like you. Not feeling well? Have an Immune Supporting Perfume. Create a themed perfume such as Romance, Courage, Fear Buster, Anger Management and Happy Joy. Grab your oils and join me in making a Custom Perfume Blend…Made to order. Or, you can hire us to make one for you at https://jennscents.com/custom-blends/ or purchase one of our premade perfumes at https://jennscents.com/shop/psycho-spiritual-perfumes/. Happy blending!